Upgrading our MWG technology platform will allow us to continue to deliver a world class customer experience better than any other grocer on Long Island. MyWebGrocer (MWG), the leading software and digital media company to the grocery and Consumer Packaged Goods (CPG) industries, today announced that King Kullen, recognized by the Smithsonian Institution as “America’s First Supermarket,” will be expanding its online retail and media capabilities through an upgrade to the newest version of MWG’s innovative eCommerce platform. Bethpage, NY-based King Kullen, a longstanding MWG technology client, operates 32 locations throughout Long Island. The new MWG platform upgrade will allow King Kullen to expand online shopping features for its guests, including a unified cart/list capability across all features. Shoppers will have a single, unified experience when building a list from the graphical weekly ad, recipe inspiration planning or shopping online compared to alternatives where planning lists and ecommerce carts are not interchangeable. Single cart/list capability along with personalized offers, merchandising capabilities and discovery via sponsored listings are key elements of the platform that increase shopper loyalty and conversion, allowing shoppers to easily expand their baskets to include new items relevant and personal to them. However, in today’s grocery ecommerce environment it is not enough to provide the best possible customer experience. Profitability is driven by back office efficiency and logistics which are key, strategic enhancement areas. Order management and picking software upgrades will leverage proprietary algorithms to optimize order fulfillment delivering best-in-class supply chain management technology. 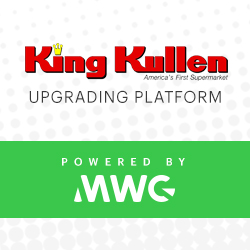 King Kullen will roll out upgrades to their MWG technology in stages over the remainder of the year, with the full MWG-powered experience scheduled for completion in Q1 2019.